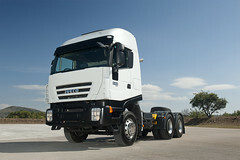 Iveco has continually been at the forefront of the transport world. Satisfaction, reliability and excellence are ensured with every job, thanks to the Origin 100% range of Iveco parts, together with the coverage and professionalism of the Iveco Service network. In a continual effort to offer our customers the best possible service, Iveco has created Elements: a wide range of tailored service packages designed to maximise vehicle uptime. How? By providing operators with total flexibility to tailor a planned maintenance contract to suit their particular operation. As an alternative to the Elements Repair & Maintenance packages, Iveco extended warranties are extensions to the Iveco contractual warranty, and can include cover for material defects, driveline related components and other key components. They provide the assurance of longer term protection against unexpected problems and include Assistance Non-Stop cover 24 hours a day, 7 days a week.